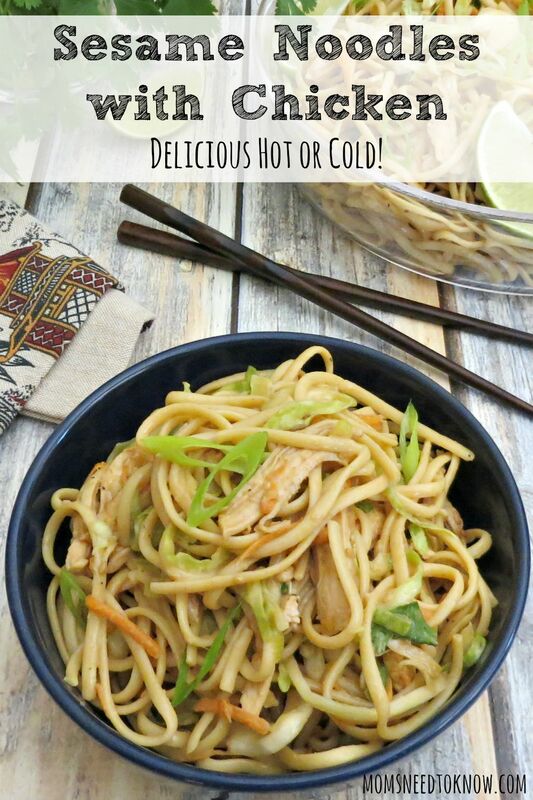 Sesame Noodles with Chicken | Delicious Warm or Cold! My mother makes the most amazing sesame noodles – really better than I have ever tasted in any Chinese restaurant. It is one of her go-to recipes for parties because everyone goes nuts for it. It can be served chilled, at room temperature or even warm! The variations are really endless with this dish. I've made it with red and yellow pepper strips, edamame, julienned cucumber, steamed broccoli and bean sprouts. The protein is optional too, but does help make it a complete meal. Try it with thinly sliced, cooked beef or even shrimp…or go meatless and add tofu! In the mood for something a little more substantial? 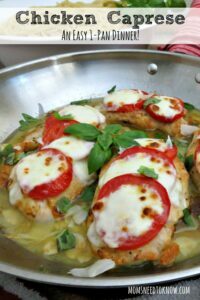 Try this one-pan Chicken Caprese recipe! 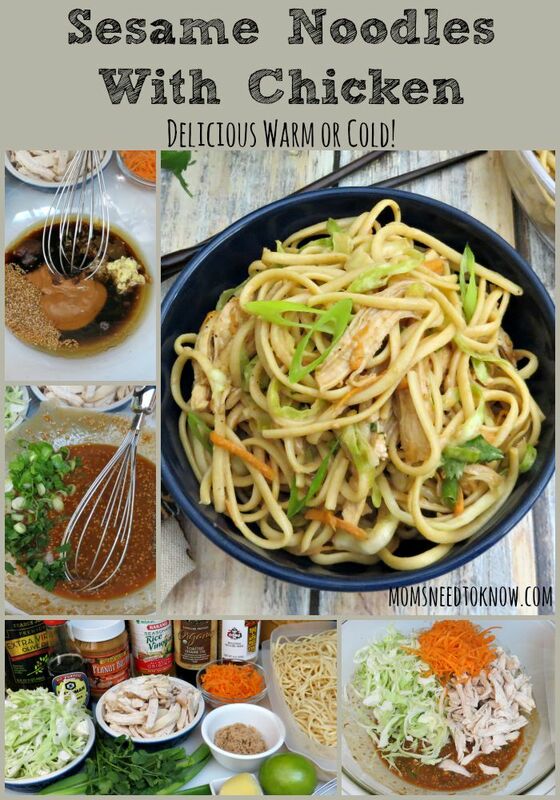 For this recipe, I used spaghetti but if your grocery store has a decent Asian section, you might want to try using lo mein noodles (Wegmans makes a fabulous lo mein noodles – found in the freezer section). I love adding the cabbage for some extra crunch and texture, but you can leave that out if you want or cabbage doesn't “agree” with you. If you want to add some more color to the dish – try using red cabbage! NOTE: Sesame oil has a strong flavor, so I suggest starting with two tablespoons and adding more as needed. You can also swap out the olive oil with canola or vegetable oil, which is a more authentic. You could add some more heat by mixing some Sriracha or chili oil into the dressing. Any leftovers will keeps nicely in the refrigerator, but it will soak up the sauce as it sits. We usually mix up some soy, sesame oil and a little water and toss it again before serving a second time. These sesame noodles with chicken are no easy to make and can easily be tweaked to suit your family. They are delicious hot, warm or even cold! Add the sesame oil, olive oil, brown sugar, peanut butter, garlic, ginger, rice vinegar, lime juice and sesame seeds to a very large bowl and whisk to combine. Taste the dressing. Here is where you'll want to add more of whatever you like along with salt and pepper. I usually like more acidity in mine and add more lime. If you want some heat, add the crushed red pepper. When the sauce is how you like it, add the cilantro and green onions, reserving some for garnish. Stir to combine. Add the carrots, cabbage and chicken and stir to combine. Serve immediately with some cilantro, green onions and carrots sprinkled over the top for garnish. These noodles are calling my name! Thanks for linking up with What’s Cookin’ Wednesday! I am looking for a cold dish to make as a main dish for my husband’s birthday since were going to be doing a picnic with a group of people wondering how many people this recipe will serve? This sounds like a really good recipe. I was wondering how much chicken to put in.